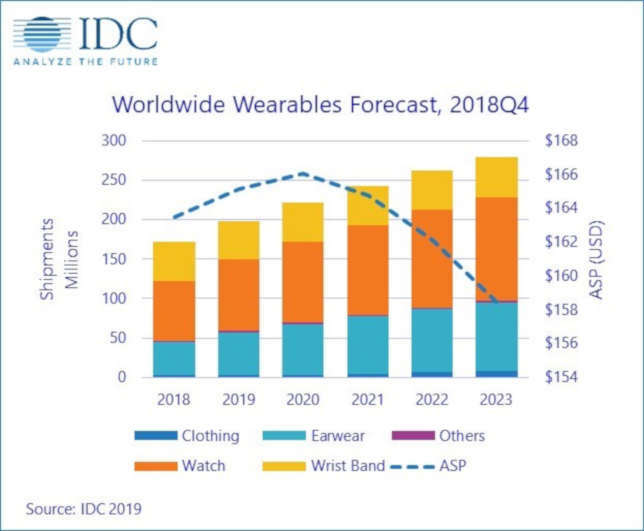 According to a new report released by IDC, wearables will increase 15.3 percent worldwide in 2019 compared with 2018, with 198.5 million units expected to be shipped this year. IDC forecast smaller but still substantial annual growth (8.9 percent) through 2023, when shipments are expected to hit 279 million units. Watches made up 44.2 percent of shipments in 2018 and are expected to account for an even larger percentage of the market by 2023, 47.1 percent. But headsets/ear-worn devices will have a major impact on that growth with the rise of smart assistants, reaching 31 percent of the market by 2023. "The rise of smart assistants on wearables, both wrist-worn and ear-worn, is a trend worth watching," said Jitesh Ubrani, research manager for IDC's Mobile Device Trackers, in a prepared statement. "Though still in its infancy, the integration of these assistants with wearables opens up new use cases, from allowing these devices to tie into the smart home to making the devices more proactive at urging users to live healthier or more productive lives." "Two major drivers for the wearables market are healthcare and enterprise adoption," said Ramon T. Llamas, research director for IDC's Wearables team, also in a prepared statement. "Wearables stand to play an important role in digital health, constantly collecting important patient data while also giving patients the ability to self-monitor. Within the enterprise, wearables can help to accelerate companies' digital transformation by transmitting information back and forth while allowing workers to complete their tasks faster. This is where both vendors and companies can streamline processes to achieve faster results."